Meanwhile here is some orbital orrery. I was rooting around in one of my closets when I came across the following Usenet post about nonrelativistic gravitational orbits, written, I regret to say, by me. I was quite horrified to realize that it took me a loong time to figure out what I had meant. So i made a picture. With Inkscape. Since I didn't make it with gnuplot, it is not exact or to scale. So sue me. One is the gravitational potential itself, and the orbits thereof. The other is the 24 hour rotation imposed on the problem by a rigid tower co-rotating with the earth. As he passes geostationary point, your free orbit (the path you describe between demonic possessions) circularizes, the distance between foci of your orbital ellipse goes to zero and then reappears turned thru pi/2, and eccentricity increases again, until it crosses 1 at parabolic orbit and (earth) escape velocity point. I have always found that imposing the daily co-rotating frame leads to all manner of complications such as hurricanes. 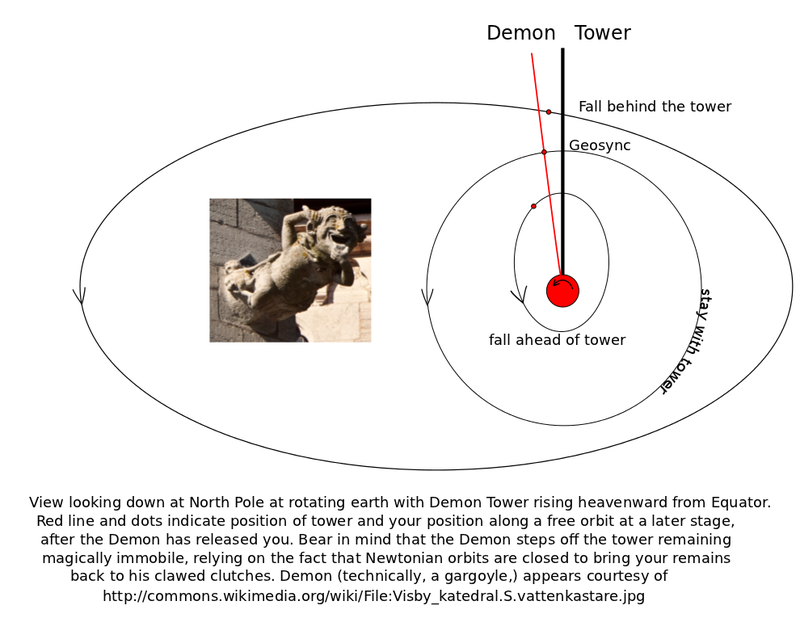 And it isnt as tho Newtonian gravity doesn't have all manner of twisted arcana, all by itself, without considering how to work it out while chasing your tail evry day. One of those arcana is the fifth conserved quantity. Fizicists are a lazy bunch and the first thing they do when looking at a calculation are the symmetries they can use to finesse the calculations. There are deep corners with inverse square forces like gravity; that magic minus 2 power ensures that orbits are closed (evry time the demon lets you go, you come back to his clutches after one orbital period, neglecting the orbits that end with a big kaboom,) but more; it is a peculiar symmetry that gives you one more conserved quantity related to the Laplace-Runge-Lenz vector, which is a litle vector that points from the central point of the force toward the other focus of the orbit and whose magnitude is proportional to the eccentricity. This is a result that exposes the deeper SO(4) and SO(3,1) symmetries and makes me feel all deep and tingly inside. probly coz i dont fully understand it. There are more symmetries here, that of reflection and such, which brings in O(4) and other groups, but i have probly said too much already. Tune in next time for another edition of the bloodshot eyeball of sidd.